Before I moved to the new Spytunes with a login and what you see here today I used to sell my courses via email as well as a bunch of eBooks. I did very little tuition on ear training. All I had was a download of super simple intervals and chord recognition. The reason was, I believe that to practice ear training you need to sing, and I didn’t have a vocal course. Don’t get me wrong, I’ve tried, I had a few singers looking into the concept but it just never really worked out, I never found the right person for it. I saw all these complicated software that turned my simple download concept into a game. I was tempted to develop something similar but knew that ultimately it was, perhaps not pointless but definitely not great, and I want great or nothing. 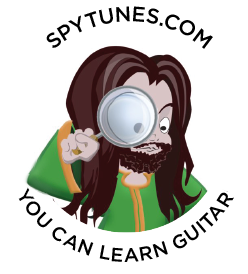 So when I moved to the new site I simply removed the simple ear training part. I didn’t develop a software and I didn’t find a singer that could teach this stuff. Maybe one day I will. The other day I listened to one of my favorite podcasts, Brents learn jazz standards. Brent interviews people who teach and play music in the world of jazz. He’s got it nailed with the title of his site, learnjazzstandards.com. If you want to play jazz, that’s what you need to do – you need to learn jazz standards. It’s a great podcast. It’s regular, he’s got great guests all discussing how to practice jazz. The other day Aimee Nolte comes on the show to talk about ear training. She says, exactly what I just described – you got to sing. If you don’t sing, you don’t anchor the intervals in your body. Just what I always believed. There are some really great ideas in this episode, like finding your perfect pitch jam. Here’s a video of her describing this (which is what led to the interview). During the interview, they mention this 9-year-old kid with perfect, and I really mean PERFECT pitch. That’s a pretty big build up, I hope I haven’t given it all away, here’s the full episode from learnjazzstandards.com, enjoy. This is my third podcast blog, previously I’ve mentioned Jude Golds, No Guitar Is Safe, where Jude actually jams with his guests and the ‘Double Stop’, where Brian Sword interviews producers, engineers and musicians from the rock world. I’m thinking, maybe I need to start a podcast. Something that doesn’t do what any of these three guys do… I’m thinking I need to start one focusing on theory and improvisation. What neither of these guys do is give you specific examples. I like the idea of exploring a theoretical concept per episode, with actual examples, so for example, an episode on Dorian, with examples you can listen to, then try yourself. The podcast medium is so great for this, it’s all listening. Sometimes scales and theory can become a bit too visual. If you got any input, let me know. And be sure to subscribe to all three podcasts I mentioned, they keep putting out great content every month, for free.